Lipodermatosclerosis is a skin condition that is most commonly seen in the lower leg. It is a type of panniculitis or inflammation of subcutaneous fat. It is most common in overweight, middle-aged patients who have vein disorders. Lipodermatosclerosis can be acute or chronic, and it can affect one or both legs. The acute form can look like an infection, and the affected area may be red, painful and inflamed. The chronic form develops over time and may appear after a bout of acute lipodermatosclerosis. The patient develops thickened or hardened skin that grows increasingly dark or red. The legs may taper above the ankles, producing a characteristic “bowling pin” or “inverted champagne bottle legs” appearance. The skin may eventually become more fragile over time and thus increase the likelihood of ulcers or open sores. The exact cause of the condition is not known. It is, however, linked to obesity, venous incompetence (leaky valves in the veins) and venous hypertension (high blood pressure in the veins). In many cases, patients develop the acute form of lipodermatosclerosis and then develop the chronic form. The primary treatment for lipodermatosclerosis is usually compression therapy to help the veins. It involves the use of compression stockings to treat ulcers and improve blood flow. These garments put pressure on the veins and reduce their diameter. They thus force the blood to flow back to the heart. The type of stocking used will depend on the extent of swelling and the presence and size of any ulcers. If the patient is obese, they will likely be put on some type of weight loss program in order to avoid vascular surgery. They will also be encouraged to elevate their leg and advised to not stand or sit for long periods. They may also be given medications that can reduce fluid accumulation, increase blood flow, relieve pain and swelling and/or prevent blood clots. If the patient has a severe case of lipodermatosclerosis, or one that has not responded to more conservative treatments, they may benefit from minimally-invasive endovenous laser ablation or balloon angioplasty/stenting. The procedure used will depend on the patient’s condition. 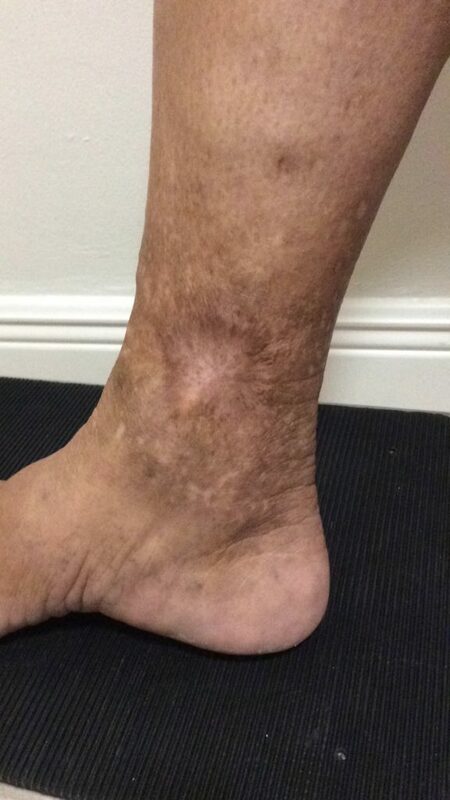 For example, if the patient simply has varicose veins that are causing the condition, the surgeon may choose to use sclerotherapy. Take the first step in treating your lipodermatosclerosis by scheduling an appointment at the Miami Vein Center in Miami. Dr. Almeida, a board certified vascular surgeon, and his team of venous experts are committed to making your venous issues a thing of the past. Contact his office today to request a consultation to learn more about your treatment options and vascular surgery. What is Lipodermatosclerosis and How is it Treated?